Nikolas is our third child. A joy to our lives. He was born with probable Lenz microphthalmia syndrome. Probable because he tested negative for the gene but his genetic doctor made a clinical diagnosis. This is an extremely complex and rare syndrome, involving extensive medical and physical difficulties. Nikolas is also battling cancer right now. He has Stage 5 Wilms Tumors. God gave us Nikolas for many reasons. And we learn those reasons every day. I have thought so many times about updating Nick's blog...it seems like so much was going on with his cancer treatment, then I started nursing school, which is a never-ending study session! So many things go on in our lives, we are always so busy, I feel like I never have enough time to do anything, especially blogging and of course, cleaning! But enough of that...Nick is doing relatively well! Where to start? Well, he continues to have scans, or ultrasounds and X-rays every 3 months to check for the cancer coming back and so far, praise The Lord, they have all been clear! We also go back to St. Jude yearly, for check-ups with their team. 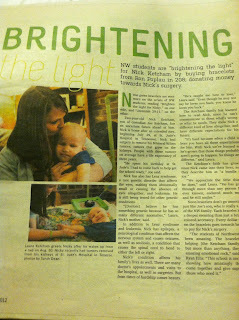 Nicky is in pre-school and goes twice a week to the Lee Ann Britain Infant Development center. He just loves it! His class is small but consists of other kids with special needs and peer models as well. He also goes to speech therapy, aquatic therapy and music therapy there also. Then we have our local school district that comes out twice a week and offers community based therapy in our home. So Nick gets to work with many people! Nicky has been struggling with 'spit up' or 'reflux' issues. I don't want to say throw up, because usually it's not enough for it to even come out of his mouth but many times it does. So essentially, he is refluxing food constantly. He is still fed strictly by g-tube and he does not have a fundoplication. He GI doctor will not recommend getting a fundo done, and after he explained how it actually works to me, I am in complete agreement with him. It would do more harm than good at this point. 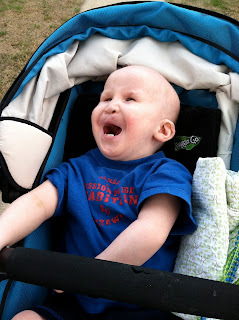 Nicky is on reflux medication, Prevacid, so it doesn't usually burn his esophagus/throat. Lately, though, it seems to be getting worse where you can tell that it burns when it comes up his throat by the look on his face. We did an upper GI series at KU and saw exactly what we expected to see, reflux into his esophagus. So at this point, his doctor recommends getting a GJ tube. He needs it. Something has to change. He can barely do anything without refluxing most of his food out. We've even decreased his feeds to over two hours per feed but it doesn't seem to help at all. So, we're waiting on the lab to get the right supplies in. It seems to be taking forever though! I just want the procedure done so he can try to get back to doing things and not having to worry if he is going to choke when he spits up! We also went to the eye doctor on Wednesday. We did not get good news. Nothing I didn't know, but she solidified it for me. And I really wasn't ready for what she said. Nick's eye pressures continue to decline. We decided after the horrific issues we had with the first retinal repair surgery Nicky endured that we didn't want him to have any more. Surgery actually made things much worse for him. Both of his retinas are detached and since they are not getting the blood supply they need to survive in his eyes they will begin to harden and that will cause his eye to basically collapse into itself. I really don't know why, but it hit me like a ton of bricks. I never cry in front of people and I almost cried in front of the doctor when she told me. I've known this is probably going to be what will happen but truly I just hoped that it wouldn't. Nick can only see light at this point. That all he has and now that is being taken away. Why? Why, does this have to happen to this innocent boy that has been through so much. It's all he has. It's the main way we use to help him learn right now. Nicky loves lights. Any light, he just loves it and is so attracted to anything that is lighted. I am mad right now. I shouldn't be. It's not my nature to be mad, I'm usually very laid back. But I just don't know how to deal with this right now. I can't handle it. I need to be strong for Nick but I don't know how. I don't know what to do for him. I don't know how I'm going to be able to help him learn and how he's going to be able to play anymore. He still can't sit up, crawl, walk, or handle things they way you and I do. He has severe tone issues and is unable to control his muscles very well. He can't just feel around and figure objects out, he can't just pick something up and manipulate it. I don't know when he will completely loose his sight. It could be tomorrow, it could be a year from now. But when I look into his eyes I can see them changing. I can see his cornea's starting to become dull, with an opaqueness to them. It is subtle but they're definitely changing. Please pray for us. For Nicky, that somehow God will let Nick retain the little vision he has, that little bit of light in his dark world. I am terrible at posting....being in school and having 4 kids leaves very little time for a blog. l hate not keeping things updated, especially since so much is always happening here. But alas, I should be studying right now and obviously I'm not. So I'm sorry to say this must be quick. Nicky finished his chemotherapy treatments on November 28, 2012!! Clean scans in December also! And his first set of 3 month scan's in March were also clear! Praise the Lord! I was getting concerned because he seemed to be in pain off and on before those scan but it was probably just a stomach bug. He has grown all his hair back and then some! In February we discovered that his right retina is starting to detach again and his ophthalmologist believed that his left retina was completely detached. We are heartbroken. They tell us he can only see light now. I knew something was different because I had been trying my little trick to get him to smile by quietly sneaking up to him and smiling close to his face. Before he would always smile, it might take a bit but he always would. He hasn't smiled when I tried in quite a while. On a brighter note, Nicky got a stander! He hasn't liked it too much, it makes him work hard. And with many adjustments he's starting to handle being in it longer. He also got AFO's (Ankle Foot Orthotics), they help keep his feet at a 90 degree angle. He hates them and can usually wiggle out of them but they are really needed for this pointy toed boy. I'll try to update again before too terribly long. God Bless! This is going to be quick....it's been very hard to post to the blog lately. But I wanted to post a few pictures and a little update! Nicky is doing great! He is gaining weight and inches rather quickly! 2 lbs in 1 month!! Yay to say the least! Also, one of my little sisters got married this past weekend and Nicky was in the wedding so I have to post the only picture I have for now, until the rest come out! 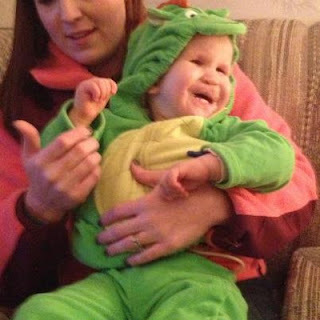 And here is Nicky on Halloween! He was a dinosaur!! At the pumpkin patch...he just loves to be outside! And the best news!! Nicky will have his last chemotherapy treatment on November 28th!! We are so very excited about this day and can't wait for it's arrival! Hasn't he been through enough? I hate writing this post. I am mad and frustrated that I have to write about this. On Wednesday, August 29th, Nick went in to clinic to start his next round of chemo. The nurse accessed him, no problems there. She sent his blood off and started his pentamadine while we waited for the labs to come back because his chemo was count dependent, meaning they have to be over a certain number for him to get the drugs. His count was 7100. Perfect, let's order the chemo drugs. So we waited for those to be brought up from the pharmacy. Nicky was slightly agitated but I think it was still withdrawal from weaning the methadone and ativan. The dactinomyacin and vincristine arrived just after we met with the nutritionist to go over Nick's diet. Nicky's oncologist came in next to go over a few things and the nurse got ready to infuse the chemo drugs. The procedure is to pull back the syringe to make sure there is good blood return and she says she did so she began infusing the dactinomyacin. Nicky was still agitated but became more so and was flailing his arms around as she was infusing and I'm trying to talk to the doctor and somehow keep an eye on Nikolas. Dactinomyacin is just a 1 ml push over 1 minute so it can be manually pushed or setup to run on the IV machine. I remember it happened so fast, the nurse pushed the chemo so quickly, no where near a full minute. And next, saline must be pushed through the line to make sure the chemo drugs do not have direct contact. So the nurse pushed the saline through his line. Suddenly, the nurse looks down and says something, I'm not sure exactly what. But the side of Nicky's chest is as big as a baseball. Literally, things had happened so fast but suddenly they were going in almost slow motion. Oh no, oh no. I don't think it really hit me right away or maybe I just didn't realize how bad this was. The doctor asks her which drug he just got. Thankfully, and the only thing good about this, it was not vincrisitine. Vincristine infiltration is usually fatal. But his doctor went to check the protocol if dactinomycin is infiltrated. The nurse left too. So Maya, our home heath nurse that day (and good friend), sits next to Nicky and starts to squeeze as much fluid as she can back out of the injection site and quite a bit is coming out, which is good. It seemed like the doctor and nurse were gone forever. Finally, the nurse and doctor come back and the nurse states that she doesn't think the chemo drug was infiltrated because she had good return just before infusing the drug. The doctor agrees and the protocol just states using ice packs 3-4 times a day for 15 minutes each time for 3-4 days. Well um, ok. There really is nothing else we can do. Except wait, watch and wait. Dactinomycin is extremely corrosive to soft tissue. If extravasation occurs during intravenous use, severe damage to soft tissues will occur. I was not too alarmed at first. Honestly, I didn't really know what happened or how severe things would become. I am a very optimistic person so I always hope for the best and I think in my mind I was really hoping and praying that no chemo drug got under his skin. They reaccessed his port and gave him the vincristine. They gave us an ice pack to use before we left and then we were sent home....and our horror story begins. The next day the area around his port looked fine. But after about 36 hours the area became a little pinkish. And it continued to look worse and worse every day. By Monday the 3rd the area looked like it was getting an infection and it was warm to the touch. We called the doctor on call and they told us to take him to the ER. 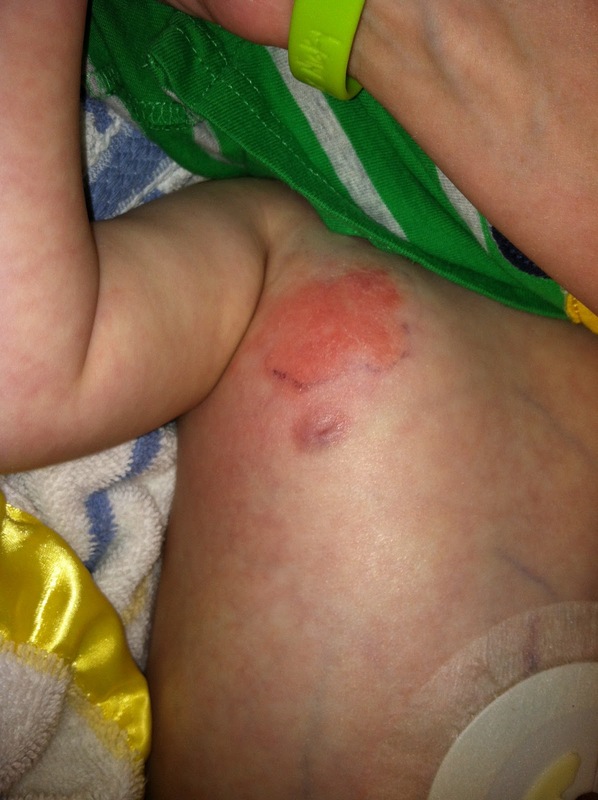 He was admitted and monitored for the next 24 hours and started on IV Clindamyacin for what looked like cellulitis. They did an ultrasound but didn't find anything significant. But since they really didn't know what to expect they really didn't know what to do or if things would get better or worse. By the next morning he seemed to be doing better so they sent us home. By Wednesday evening the swelling around the port and on the whole right half of his chest was getting significantly worse, the swelling was spreading to his back. He was also having trouble breathing. I put the pulse oximeter (pulse ox) on and he was satting about 85. Not good and he was miserable. He didn't want anyone touching him or that area. We called the doctor on call and again they told us to take him to the ER or call an ambulance. We quickly took him to the hospital again. Again, they didn't really know what to do or what to think except switch him back to IV clindamycin and give him oxygen. He was also on his highest dose of pain medicine, Oxycodone. By the next morning the swelling was worse and the whole right side of his face had started to swell too, his eye was almost swollen shut. They quickly did an ultrasound to make sure he didn't have a blood clot somewhere. Thank the Lord he did not! But we were still not quite sure why his face was swelling. He looked so miserable and it was breaking my heart because we could do nothing else but watch in horror as this terrible toxin wreaked havoc on our little boy. So long story short (because this is getting pretty long) the doctors started him on DMSO or dimethyl sulfoxide. It is sometimes used for extravastation to help with swelling. It is not used very often and is not FDA approved for many uses. But it helped. By the next day, the swelling in his face had significantly decreased and Nick continued to do better otherwise as well. They determined that the respiratory issues he had were a secondary virus and they continued to get better as well. Nick was able to go home that Saturday. So overnight the first visit and 4 days the second visit. That's enough for us! Unfortunately, our horror story doesn't end there. Through our own research and questioning a former sales representative (he used to sell these types of ports) we could not determine without a doubt that his port was not damaged somehow and that it would be 100% safe to use the port again. The sales rep informed us that the dactinomycin could not damage the port itself but it is possible it could damage the catheter. So we had to figure out some other way to give Nicky his remaining 4 treatments of chemotherapy. Our options were a PICC line, just like a port except it's peripheral and it isn't completely under the skin or give the chemo through a regular IV. His doctor felt that we could possibly use his port still, after further testing, but we really did not feel comfortable with using it again. And putting another port in was a last resort, at least that's what we were told. We didn't like either of the options but we went with a PICC line because it's safer and it can be kept in as long as it's needed. And because chemo drugs are extremely corrosive, there is a much higher chance that his little veins could not handle it and he would get infiltrated again. 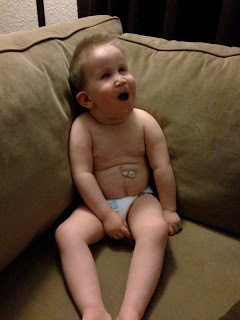 He had his PICC line placed on September 24th. He was having a broncoscopy and micro-laryngoscopy that day already so we had them place the line while he was, hopefully, still somewhat sedated. They weren't able to get it in right away and we had to have IR (interventional radiology) get it in but we still got it in that day. He had his next round of chemo on the 26th. It was somewhat nerve wracking to watch them push the chemo drugs in again knowing the potential damage it can cause but thankfully, everything went well that day. Unfortunately only 4 days after his PICC was placed it broke. Literally, a piece of it just fell off. It was clamped so it was still considered sterile but we had to take him back in the have it replaced. They were able to use the same vein but it took 3-4 tries, and 4 X-rays, to get the catheter in the right place just above his heart. And his port had to be removed. The longer it's left in the higher risk of developing a blood clot. So this is what we have been up to for the past month or so. It's been very hard. Emotionally and physically, especially for Nick. I have been extremely frustrated and hurt by some of the staff at the hospital, especially for their carelessness. Nikolas should not have had to go through this. 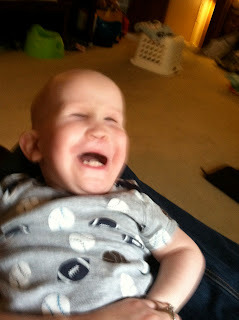 No child should have to deal with cancer, but to be hurt by the people that are supposed to be helping him is appalling. We are taking steps to hopefully prevent this from happening to any child ever again. But I'll leave that part to another post. 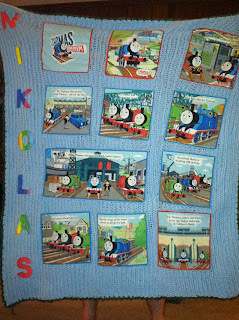 Oh and I did want to post a picture of this beautiful quilt make for Nikolas by Barbara....its so amazing and cute!! Thank you Barb! And Nicky's first walk in a long time! 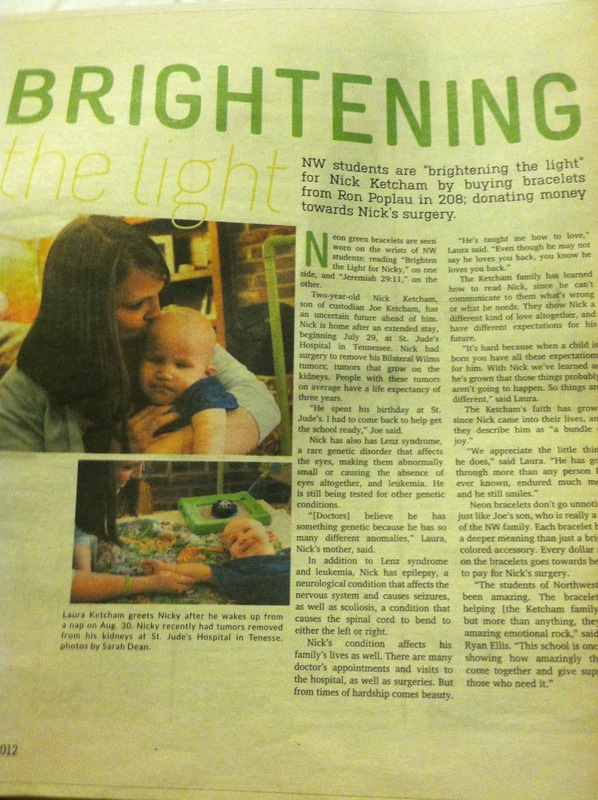 Nicky was in our local high school paper! Nikolas was flown home, not by helicopter but by a small jet. 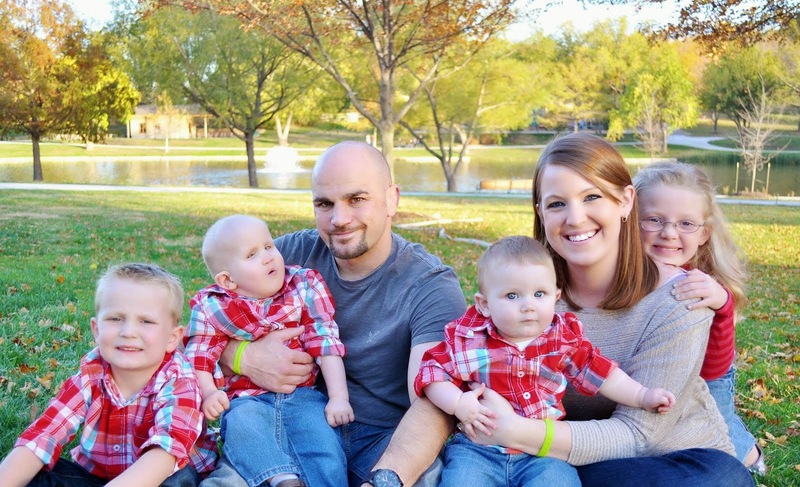 A company called Pedi-Flite and two Leboneur paramedics brought Nikolas back to Kansas. Carsen and I were able to ride too! The flight was only an hour and there was a little gps like screen I could watch to see how much further we had and it showed how fast we were going! We got up to 432 mph! That's a speedy delivery! We arrived at the Kansas City Downtown airport, then hopped on an ambulance for the rest of the ride to the Children's hospital. It was pretty neat to see how they transport patients both by air and in the ambulance! Nick did great with the flight too, he only slightly dropped his sats on take-off and landing but the paramedics were easily able to adjust his oxygen settings to get him back up. We arrived on the 17th which was a Friday, and of course, they don't do much over the weekend. But we knew that would happen and we're really just thankful to be home. We met with ENT and they came up with a plan. They would do a broncoscopy and laryngoscopy in the OR and attempt extubation then. And start steroids on Saturday to reduce swelling. It was so red and he had almost blister like protrusions all the way down his airway :o( When he cried it sounded so sad and miserable. The next 72 hours are the most critical and they kept giving him steroids and high pressure oxygen to help keep his airway open. They even tried an oxygen/helium mixture but that didn't go over too well. That first night was rough, we were all just hoping and praying that he would not be reintubated. Joe stayed with Nikolas in the PICU while at Children's because I am still breastfeeding Carsen and he is not allowed to stay overnight. When I came back in the morning, miraculously, he was completely off the oxygen! They weren't even using blow by! (That is where they just put the oxygen tubing close to but not on his face). Nikolas had been on strong sedatives (Fentanyl and Versed) for about 2 weeks while he was intubated. It would take weaning him off of the drugs for some period to slowly allow the drugs to leave his system. Otherwise, it could cause a lot of adverse affects, including seizures. So they switched him to Methadone and Valium. I questioned the Methadone but the doctors seemed sure it was what he needed to wean off the Fentanyl. That drug stinks, Nicky has had a hard time with it. Including his left cheek turning bright pink and very warm 15 minutes after he gets it. We will be weaning him off for about 3 or more weeks. Nikolas continued to do better and was moved to the floor on the 23rd. But after being on steroids and all these other drugs for so long we were having a very hard time keeping Nikolas comfortable and he was NOT able to sleep at all. Literally, I think he was awake for almost 3 days straight. It was excruciating and frustrating because not only was he awake, he was in withdrawal pain and constantly cried. And it was the saddest thing, he would cry but barely any sound would come out, it broke my heart! I don't know why no one thought of it sooner but the steroids were probably causing him to be unable to sleep, but it took a few days before we figured it out. So we stopped the steroids. He was getting pretty high doses of Valium and even Ativan, which usually knocks him out, but it wasn't doing anything until the steroids were out of his system. I think those few days he was so uncomfortable and wasn't sleeping were some of the worst we've ever had. Joe was at work for most of the day and I had Carsen at the hospital with me so I was trying to manage two upset children in a cramped space with little help. Carsen hates the hospital. He may only be 6 months old but he hates being in the same hospital room all day long with little outside interaction. Finally Nikolas settled down, the steroids were finally out of his system and he was able to sleep. We got to go home on the 26th. 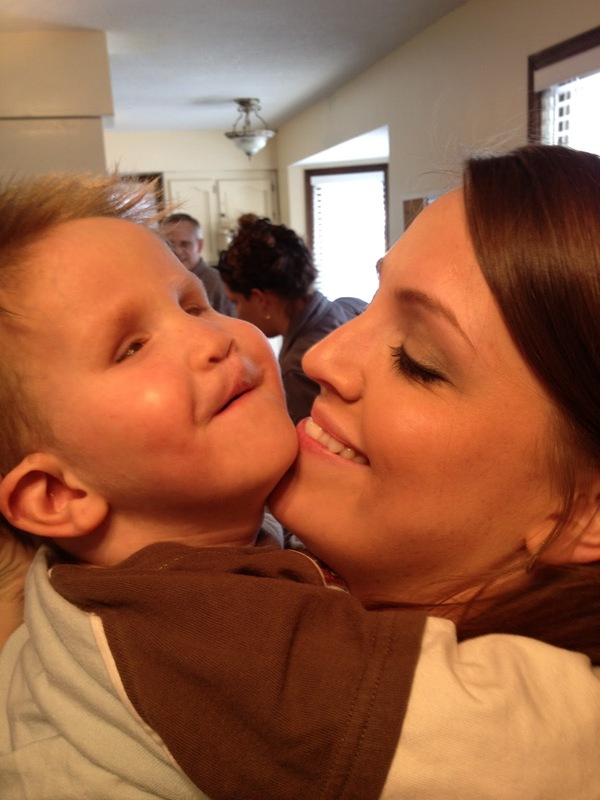 Nikolas was in the hospital for 23 days (20 in the ICU) and was away from home for 28 days. We were all very excited to be in the same car together! This picture is at St. Jude when he was still intubated and having a 24 hour EEG done. He wasn't awake for very long but gave still gave us a great smile! Honestly, it feels like he's been on this earth much longer. I feel like he's been through so much, much more than most people will go through in their lifetimes. And with so much grace and joy as he still continues to smile through it all. I just wish it didn't include so much pain, but I think that God made Nikolas special so that he can handle it much better than anyone else would be able to. Even though the past two years have brought many ups and downs, Nikolas has taught me so much. He has taught me how to love someone, unconditionally, not expecting anything in return. He has taught me that even though the world can be full of so many terrible things that it's still okay to smile. And to smile and love every moment because every moment is so precious. He has taught me to enjoy the little things, the things that really matter. He has taught me to care for someone and to push to get whatever he really needs done to actually get done, especially in hospitals and with doctors and nurses. I love this little boy more than I can ever explain. I think any mother could say that about their child but somehow, I feel that my love for Nikolas goes beyond that. That my heart has expanded so much more than I ever thought for that little boy....I love my 3 other children just as much but with Nikolas, it's different somehow. Nikolas is still having a hard time recovering. They extubated him on Wednesday the 8th. But he was having a hard time breathing and his oxygen levels kept dropping to dangerously low levels so they tried to put him on a cpap/bipap machine that uses a mask to blow oxygen into his lungs. He did okay on that for a couple days so they were able to transition him to a high flow nasal canula. But Friday evening he started having a harder and harder time breathing and his lungs sounded very course. His chest X-rays also started to look worse and worse...his lungs were slowly filling up with fluid. And by Saturday morning his right lung had collapsed and he had to be reintubated for the third time. My heart broke as I watched his limp body on the bed, trying to get a tube down his throat so he could breath. The first one they tried was too large, it was the same size they had used during the last intubation and surgery but his airway was so swollen that it wouldn't fit down so they had to use half a size smaller. Nikolas has always had issues with being intubated. Either with stridor or requiring oxygen for 5-6 days after being intubated. His epiglottis has been described as floppy and very narrow and it may be possible that he somehow reacts to the plastic on the tube. But at this point we don't know what to do. We have tried multiple attempts at extubating, including using steroids and breathing treatments but his little body cannot handle working so hard to breath...especially after such a major surgery. We need to consult with pulmonology and ENT to figure out how to get him off the vent. And hopefully soon because mechanical ventilation actually can cause the lungs to collapse so the longer he is on the vent the harder it will be to get him off. There is talk about transporting him back to Children's Mercy via helicopter, as soon as Wednesday. Which would be so helpful to myself, it's hard to be away from Joe, Brianna and Benjamin. And Maya (also Aunt Yaya) has been so gracious to come with us to help....a lot..... and I know she needs to get back home to get things done as well. But at the same time I don't want to make a bad choice just because I want to get home. 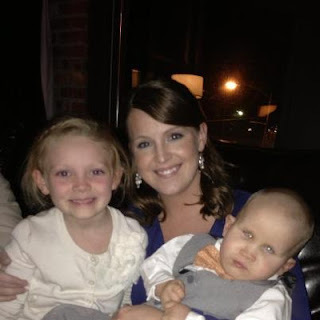 St. Jude is amazing, it really is but since they are so specialized they may not see many kiddos like Nikolas and not have the experience in helping him the way that a larger hospital like Children's would. We will see what the next few days bring us and we will just continue to pray that Nicky's little body will heal faster than ever possible! Carsen wants those tubes out! This was from the night before surgery...enjoying some chocolate!! More presents and balloon from the hospital....they are really too sweet! Sorry for the late posting. I've been able to update Nick's Facebook page, Brighten the Light for Nicky, more constantly but because of internet issues here at the hospital it's hard for me to be able to post to his blog. Nick had a very full week of appointments with many specialists, from anesthesia to nephrology to neurology and of course oncology. The doctors are very nice and really seem to want to get to know him so they can take care of him better overall. Nick also had many tests. He had a CT of his abdomen, an ECHO, an EKG, multiple lab draws and urinalysis'. 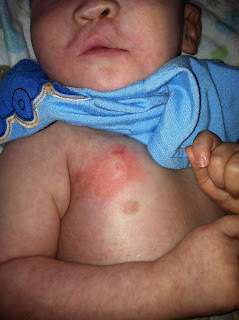 Nick's ANC (absolute neutrophil count, when it's lower he can get sick very easily) on Monday and Tuesday was 400 even. He his ANC had to be over 500 for him to be able to have the surgery. We prayed and we asked many others to pray with us that it would reach 500 so he could have the surgery. They rechecked it on Thursday. It was 500 exactly! I could barely believe it! God is so amazing! Then the surgeon went overt everything with us, how he thought he was going to be able to remove them and what could possibly happen if he couldn't get all the tumors from each kidney. Nick had surgery on Friday. Dr. Davidoff blocked the whole day for his surgery, knowing it would be difficult and extensive. Nick went back about 7:30 for anesthesia but they didn't actually start the surgery until around 10 a.m. They put in an epidural and tried to put an arterial line in and they stuck him probably about 20 times, including trying his femoral artery in his groin area. But could not get it. Thankfully, Nick was out and didn't feel it, but he has the marks to show for it. The surgery took a total of about 8 hours. Then the surgeon came out to talk to us. He was able to get all of the tumors!! Amazing! Praise God! There is always some microscopic cells left which will be treated with chemotherapy and possibly radiation but he was able to remove them! He said it was very difficult but he was happy with the results. Nick had to be kept intubated and sedated for the rest of the day and they were able to extubate him the next morning. He is also very swollen, all over. He can't even open his eyes they are so swollen. When they do a surgery like this, and remove half of each kidney, they push fluids like crazy trying to make the kidney's work hard to keep them functioning properly. He has had issues with pain and keeping his oxygen up since. Nick's sats dropped really low, into the 60's. He was coughing and seemed to be getting some stuff up so this other nurse comes in and started to suction him but she used an adult size suction tube and she must have stuck it way back in his throat because he started to bleed like crazy. Normally if I suction him at home he might bleed a little if I'm not careful, because his palate is unrepaired it leaves a lot more of his throat exposed than normal. Well this nurse was not being careful and he's had more and more issues since. It obviously caused swelling and a lot of irritation. The doctor was very concerned because of all the blood. Well he keeps desaturating which requires him to be bagged, which is just more pressurized oxygen which pushes more air into his lungs. He does not like masks or anything on his face for that matter and of course he just keeps knocking things away because who wants air blowing in their face? And this morning his sats dropped really low again, into the 40's, and he was having a hard time recovering. We tried many different things to try and keep his oxygen levels up. But they had to reintubate him. This is horrible. This is about 6 steps back. Being intubated is very hard for Nick and to get as far as we did and now we're going to have to do it all over again is gut wrenching. He also is requiring plasma and blood. My poor baby. I knew this surgery would be hard but this is far worse than I expected. We haven't even gotten to see him open his eyes yet and now he's sedated again. Please pray for him, pray that he can heal quickly and recover from this difficult surgery. 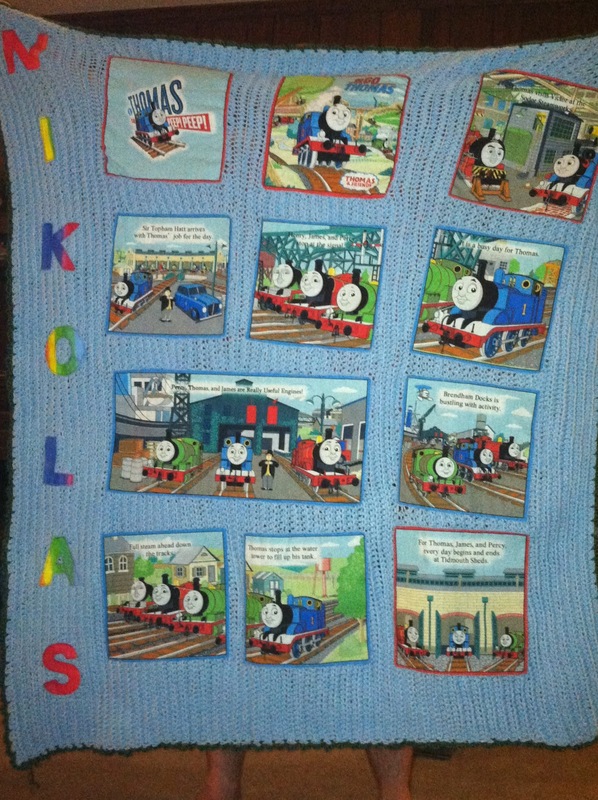 We welcome any donations to help with Nikolas needs and the financial needs of our family. He needs many medical devices and equipment that his insurance will not cover.Thank you for the support!